The Peabodys were in my parents' Saturday Night Discussion Group, and somehow we knew them anyway. They had 3 kids, David, who was a boy, and two girls: Felma and Saye. Felma was older than me and Saye was younger, and they were both in my school. One day the Peabodys took a (second?) mortgage on their house and used the money to invest in the city’s first Sam The Record Man franchise. They put it in the Garden City Shopping Centre, and that was back ine old days, before the mall was expanded to include Eaton’s. Later they moved into the newer part of the mall. Both parents and both girls worked in the store, but never all at the same time. Over the years I bought lots of LPs there. Later other locations opened up – one in Unicity, one in Portage Place, one in Polo Park. And then even later than that, the whole chain went down the tubes. I don’t remember the name of the girl that was working at the dentist where I had my root canal in January of 1994, but she looked familiar. “Did you ever shop at Sam The Record Man?” she asked me. Surely. So that’s where she used to work. So, we got to talking... I just got a really good quality copy of Rainbow Bridge I told her.. 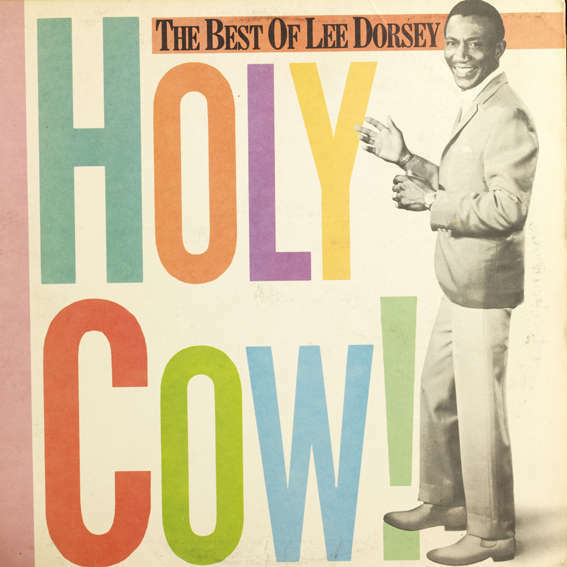 This album is called Holy Cow The Best Of Lee Dorsey. It has 12 tracks, 7of which were top 100 singles. 2 top 100 singles are not included: This Old Car and Go Go Girl, both from 1967. Ya Ya – I don’t know a la la is or why you’d want to sit in one. I don’t know what a ya ya is or why you’d want to wait for one. But this piece of New Orleans rock and roll whimsy was Lee Dorsey’s first hit and was covered by John Lennon twice – first on his Walls And Bridges in a somewhat truncated rendition with his (then) young son Julian playing (awkward) drums, and then in a more fully realized version on Rock And Roll. And the song appeared on the same collection that had all those tracks by Tony Sheridan with The nascent Beatles, but Ya Ya on that album was performed by The Beat Brothers, whoever they were. From the fall of 1961. Do-Re-Mi - If Julie Andrews had been dead when this was released, she would have rolled over in her grave. This is New Orleans groove par excellence, subtle humour, great dance rhythm. The follow up hit to Ya Ya, early 1962. People Gonna Talk – Some musings on human nature, with a great beat. B side of Do-Re-Mi. Ride Your Pony – A song for dancing about dancing. The double entendres fly thick and fast; in fact the whole song is a double entendre. The great Alain Toussaint makes his mark, and Lee Dorsey’s career would never be the same again. From the summer of 1965. Get Out Of My Life, Woman – It doesn’t get more straightforward than that. No teardrops or self-pity here (lyrics about same notwithstanding), just the facts. Covered, decently, by The Butterfield Blues Band on The Resurrection Of Pigboy Crabshaw. From the spring of 1966. Can You Hear Me – Hard to tell exactly what’s going on here. It seems to be an exhortation to dance, but not only is Lee concerned about whether he is being heard, he is downright frustrated, evidenced by the repeated use of the epithet “dammit,” which would surely have kept this song off the radio back in 60-whatever, had any attempt been made to get it there, which surely there wasn’t. Holy Cow – Do people still use this expression? Is it politically correct? It’s a heartbreak song, but a fun one because it’s got a great New Orleans backbeat. A hit in the winter of ‘66 /’67. The last top 10 hit Dorsey would have, at least on Billboard. The Band covered this on Moondog Matinee. Working In The Coal Mine – How can you create a record that faithfully represents the misery and daily fatigue of exhausting relentless work, and at the same time is incredibly fun and has a great dance groove? When Alain Toussaint died, the world lost a genius. A top 10 hit in the autumn of 1966. Love Lots Of Lovin’ – Boilerplate. I love the direct approach: “You know what I need, come on, give it to me.” This is duet with Betty Harris. Everything I Do Gohn Be Funky – Based on this track I’d say he’s telling the truth. From the summer of ’69, Lee’s last hit. Yes We Can - A “let’s all get together and love each other” song, covered later and more famously by The Pointer Sisters, as Yes We Can Can. There is at least one person out there who is a dedicated Ray Stevens fan, and I know this because there is a Ray Stevens blog (Google it). 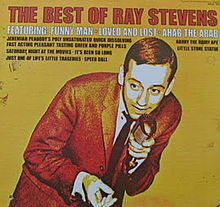 So I won’t say too much, just this: I grew up hearing Ray Stevens on the radio, so that may explain something about the odder aspects of my character, and I put my collection together from an album called The Best Of Ray Stevens, an early compilation, which I probably picked up at Pyramid, which you know about because you’ve read my previous posts, and a K-Tel album, which I believe I bought at Rainbow’s Gold, a store on Cumberland in Winnipeg which was, while it lasted, associated with Red River Books. • Funny Man – It can’t be an accident that there are so many songs by men about hiding their true feelings, either by acting the clown - laughing on the outside, crying on the inside - (The Great Pretender, Tears Of A Clown, Tracks Of My Tears, Everyone Loves A Clown, Two Faces Have I, The Joker Went Wild etc), or by some other means, usually meteorological (Crying In The Rain). In this case, not only is Stevens’ minor hit from the spring of 1963 part of what was an evolving tradition, but the title also serves as a kind of signature song for his career. It took the likes of Jackson Browne to put an end to all this macho posturing. • Loved And Lost – Disputing the classic wisdom. In the acute stage of heartbreak. I’d like to hear what the sequel was a year later. All these bunch of songs were from 1963. • It’s Been So Long – And this may just be the sequel I was talking about. If so, he’s vindicated, at least in his own experience, but there’s a blandness to this middle of the road I-haven’t quite-found-my-own-style song, with a muted saxophone in the right channel, and a chorus straight out of Nashville. This is not the song that appeared on Harry Nilsson’s first album. • Just One Of Life’s Little Tragedies – Think about it, trivializing the serious by exaggerating the trivial. At least he confronts himself on this one. • Ahab The Arab – The sheikh vs. the sultan. Don’t ask me to explain; I don’t get it either. Here’s where Ray hits the big time, with his combination of humour and inanity, and it’s not always easy to tell which is which. From the summer of 1962. Caution on this one, the original was on Mercury, but he rerecorded it for Barnaby later. 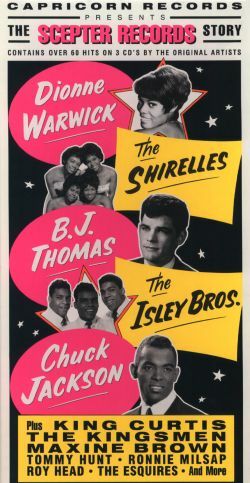 • Saturday Night At The Movies – Not The Drifters hit. A story of a romance temporarily gone awry, but saved by a wayward toupé. Don’t ask me, it wasn’t my idea. And I don’t imagine that younger listeners would get the Porky Pig reference. • Harry The Hairy Ape – Wherein an ape becomes an inadvertent rock and roll star. I’m not sure how to take this. Ray’s second (and last) big success on Mercury, from the summer of 1963. This was also rerecorded for Barnaby, but it’s easy to tell the difference – the reference to the mashed potatoes is changed to the “boogaloo-shingaling” on the remake. • Speedball – I can’t make out whether the gruesomeness of this is due to innocence or lack thereof. It’s kind of funny though. His last Mercury hit, from the autumn of 1963. • Isn’t It Lonely Together – It’s hard to believe that there was a time that if your girlfriend (or not your girlfriend) got pregnant you had to marry her. That wasn’t always a happy ending. The version I have, from a K-tel album, is edited down to about a minute and a half. Also recorded by O. C. Smith. • Indian Love Call – If this is meant to be silly, it doesn’t work. But as a straight update of Slim Whitman’s hit from 1955 it’s superb. Ray proves that he can really sing, there is a what sounds like a clavinet and what are definitely vibes, and a chorus that sounds like it just happened to be passing by. From the fall of 1975, and the latest song on this collection. • Freddie Feelgood (And His Funky Little Five Piece Band) – This is a novelty record. The novelty is Ray impersonating different musical instruments. That’s the novelty. Had he thrown in Gitarzan’s monkey, this’d been perfect. As it is, it barely scraped into the top 100, in the summer of 1966. • Nashville – For all his reputation as a novelty artist, Ray was best when he did straight music with a country flavour. Catalogue this one under songs that celebrate country music and songs that celebrate American cities. No relationship, as far as I know, with the film of the same name. • Turn Your Radio On – Imagine a world with no world wide web (in other words no YouTube or iTunes) and no MTV. Radio was a much bigger player than it is now. This is from the winter of 1971 – 1972. His “get in touch with God” lyric had nothing to do religion in its ordinary sense. • Misty – Zounds! I will get tarred and feathered but I insist that he leaves Johnny Mathis in the dust. I do realize that this is apples and oranges, sort of, kind of, but after all it’s that same song. The countrification may be just what it needed. Whatever, it works. From the summer of 1975. •America (Communicate With Me) – Trying to understand what’s going on and how to respond and how to connect can be confusing and that’s what Ray is singing about here. Plus the hippy dream vs. establishment values. From the summer of 1970. • Sunday Morning Comin’ Down – It was late 1969, I was 12 years old and I was sitting in a small lunch counter with my father and some other fellow, and I had a teen magazine that I’d bought, and it had song lyrics in it, and it had this song, and the artist was identified as Johnny Cash, and that puzzled me, because I’d heard the song on the radio and it was Ray Stevens who did it. I guess Cash’s version got more attention overall, and it is certainly the one that people (meaning the media) remember(s), but Ray’s version was the one on the pop charts and on top 40 radio, and it was the first of the Kristofferson explosion, followed by Me And Bobbie McGhee by Gordon Lightfoot (the b side of If You Could Read My Mind, it got some airplay here), Help Me Make It Through The Night by Sammi Smith, For The Good Times by Ray Price, and Me And Bobbie McGhee by Janis Joplin. I like the clavinet, and the overall feeling of melancholy. From late 1969. • Moonlight Special – I must have never watched Midnight Special (1972 – 1981) because I had to Google to learn that Wolfman Jack was the weekly announcer. Here he is rendered in all his glory as “The Sheepdog,” as he introduces “Mildred Queen & The Dips” (now who do you suppose they are?) and some demented piano-pounding incoherent Neanderthal with a name that starts with Jerry Joe and ends with Jimmy Billy. This is actually mildly funny; compared to The Streak or Briget The Midget it’s the Marx Brothers. From the summer of 1974. • Bridget The Midget (The Queen Of The Blues) – in which we are treated to a narrative about an unbelievably awesome diminutive entertainer, the said entertainer who sounds like Ray Stevens on helium, her backup singers - a group called Strawberry & The Shortcakes (get it?) - who sound suspiciously like Alvin & The Chipmunks, and the constant interruptions of a pervert who wants nothing more than to assault the singer. Isn’t that funny? This isn’t even good enough to be lame, but the radio was playing it in the winter of 1970 / 1971. • The Streak – Streaking was a fad that lasted less time than the amount of time that this was on the charts. This was Ray’s second number 1 hit, and whereas the first (Everything Is Beautiful) was a cloying attempt at sentimentality, this was a failed attempt at humour. From the spring of 1974. John Addison was a movie soundtrack composer but he wasn’t as famous as John Barry. He did mostly movies, none I’ve ever heard of, and some TV shows. · The Love Song Of Tom Jones – Addison won an Oscar for his soundtrack to the movie version of the Henry Fielding novel Tom Jones in 1963. Not to be confused with Tommy Hunter (a staple of Canadian TV in the 70s), Tommy Hunt was a decent R & B singer, at least the equal of the likes of James Carr or labelmate Chuck Jackson, who didn’t really seem to have gotten a break. My collection comes from The Scepter Records Story. • Human – One of those R&B slow dances; if you aren’t paying attention you might think that you’re listening to Hurt. The lyrics state the obvious, maybe too obvious – this was Hunt’s biggest hit and it only made #48 on Billboard. That was in the fall of 1961. • I Am A Witness – She was with me, now she’s with you. You’re boned. Maybe. I don’t know if his warning is valid or if he’s just blowing smoke, but he recruites The Shirelles, The Sweet Inspirations, Dee Dee Warwick, Mickey Baker, and Bernard Purdie to help him get the message across. No arguing with that. From the fall of 1963. • Oh Lord What Are You Doing To Me – A bit maudlin, though the execution is decent. There is an alternate universe for groups like The Greenbriar Boys. Read about them and they were legends, seminal figures in the bluegrass / folk world of the early to midlate 60s. If you lived in that universe, and many did (do? ), they were major. If you lived in the other universe, or any other universe, you probably never heard of them. It’s that way in the musical reality. I only have one track. 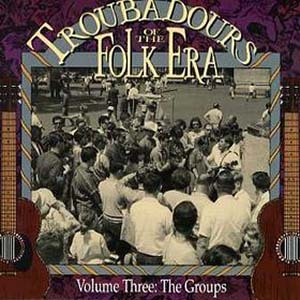 It’s from a collection called Troubadours Of The Folk Era, Volume Three: The Groups. If there were any justice in this (musical) universe, I’d have a compilation album, and it wouldn’t be hard to acquire. One visit to Amazon would do it. But if I got compilations for all these groups that I don’t have, I wouldn’t have enough money left for anything else. It’s a simple case of too many groups, too few funds. • Stewball – It’s the mandolin that does it. This song was done by others, most famously by Peter, Paul & Mary, and most differently by Lonnie Donegan (that may not even have been the same song), and each version has different lyrics from each other version. No matter how you cut it, Stewball was some horse. Not to be confused with James Dean, the dead actor, Jimmy Dean was a country singer and TV host. He had 11 hits on the pop charts between 1957 and 1 more in 1976. 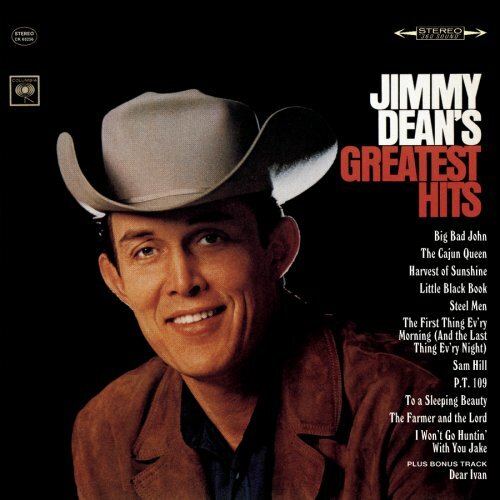 What I have here is Jimmy Dean’s Greatest Hits, which has 7 of those 11 Columbia hits, and 3 more songs besides. • Big Bad John – The enigmatic good guy / bad guy. A loner. If you spoke at all you just said “hi” to Big John. He killed a fellow in New Orleans over a girl, and he saved the lives of a few dozen miners, sacrificing his life in the process. Superman never had to die, neither did Batman. But Big John, to be the consummate hero, he had to die. I wonder. The song was number 1 in the fall of 1961. • The Cajun Queen – She had a cameo role in Big John. Now here she is again. “He started breathin’…” They couldn’t leave the legend alone. From the winter of 1962. • Harvest Of Sunshine – A countrypolitan singalong. This is just south of what Dean Martin was doing a few years later. • Little Black Book – Proof that not all songs about romantic breakup are sad or angry. Big question: is the chirpiness real or put-on? I don’t know, but it sounds real enough to me. From the fall of ’62. • Steel Men – A major scale industrial tragedy set to music. Think The Wreck Of The Edmund Fitzgerald done by someone with Asperger’s Syndrome. Apparently a true story, from Vancouver, 1958. I don’t know if that was Vancouver, B.C. or Vancouver, Washington. From the summer of 1962. • The First Thing Ev’ry Morning (And The Last Thing Ev’ry Night) – An I-miss-you song, and another Dean Martin knock-off, even down to the vocal inflection in this case. From the summer of 1965, this was the last hit Dean would put on the pop chart for 11 years. • Sam Hill – Some country dude meets his girl every night for a bit of cha cha, and everyone’s a-flutter, wonderin’ “what in Sam Hill’s goin’ on.” What an innocent age it must have been. • P. T. 109 – Historical pop, right out of the Johnny Horton stylebook. The song was about the wartime adventures of John Kennedy, who was president when this song was a hit (spring, 1962). I bet the radio stations never played it again after November, ’63. • To A Sleeping Beauty – A father-to-daughter recitation, and an unbearably hokey one. This was the B-side of A Cajun Queen and a hit in its own right, in the winter of 1962. I have a version by Jackie Gleason, and it’s no better. • The Farmer And The Lord – Done in the same style as the sleeping beauty song – that is Jimmy reciting the lyrics, with an angelic male chorus in the background, barely discernable instrumentation. • I Won’t Go Huntin’ With You Jake (But I’ll Go Chasin’ Wimmin) – Awesome. This is the most country of anything on this collection, its obvious parody status notwithstanding. I mean… this is a parody… right? The restaurant is built to look like a train station and it was the first time I was there though I’d walked by it enough times. The table was outside and we had a parasol. We had a salad between us that no one was eating and a Corona each. I will probably never see her again. It was the only evening we spent together, though we ate lunch together nearly every day. I shared music with her, random stuff. And so maybe she wanted me to know that she actually listened to it, that she was paying attention. 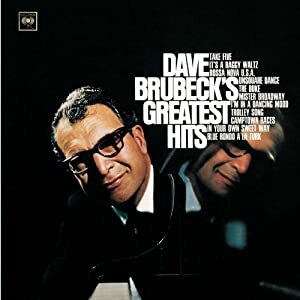 This is Dave Brubeck’s Greatest Hits. Brubeck was one of those unusual jazz artists who actually put records into the top 100 (3 in his case) so the concept of “Greatest Hits” isn’t that off. When Brubeck died, recently, I IM’d her. He was part of our history. • Take Five – One of the most recognized jazz anthems, this was actually written by Brubeck sideman Paul Desmond, who plays the signature (alto) sax. Brubeck, as usual, plays piano. The song reached number 25 on Billboard in the fall of 1961. • Trolley Song – Judy Garland did this, but it sounded different. • Bossa Nova, U.S.A. – Not to let Stan Getz outdo anyone. From the winter of 1963. • Unsquare Dance – How cool would it have been to have heard this on top 40 radio? From the winter of 1961 / 1962. • Blue Rondo A La Turk – Mozart. I have a family and I work, I have some friends, and I go the library a lot.